Are you being asked to generate more leads without being given more resources to do so? Here’s how you can use themes to get more leads with limited resources. B2B marketers state that their greatest barriers to lead generation success are the lack of resources in staffing, budgeting, or time. Content marketing generates three times as many leads as traditional outbound marketing, but costs 62% less. So, the solution would seem that if B2B marketers want more leads for less cost they should do more content marketing, but a survey by Content Marketing Institute and MarketingProfs found that 50% of B2B marketers’ top challenge was producing content consistently. The solution isn’t to create more marketing content; it’s to do more with what you are already creating. By having a quarterly and monthly theme, you can align all of your content, campaigns, and promotions around a consistent message. From your customer’s perspective, there will be a consistent experience across your social media presence, blogs, webinars, and so forth. From a goal perspective, you should get more people signing up for your content if everything is aligned. An industry thought leader retweets one of your messages that then catches the attention of an ideal prospect. That ideal prospect checks out your Twitter feed and sees a blog post related to the topic of the original retweet from the industry thought leader. The ideal prospect reads the blog post and comes to the end where there is a call to action for a webinar on the same topic. The ideal prospect signs up for the webinar. Inside sales follows up with the prospect using a special script on the theme topic of the month. As a result, a prospect has been converted into a customer. Hopefully, you see how powerful designating a theme can be, as well as how easy it is to do. There are no complex strategies or tools needed; you simply define a monthly theme. Actually, there is a little bit more to it than that, but don’t worry; this is where the time savings comes in. Let me explain by providing an example. I recently was working with a startup that sells software for call centers and we were planning the company’s content plan for the upcoming year. We did this by first choosing the first two quarters’ goals. Those themes were Agent Engagement and Workforce Efficiency, two hot topics in the call center industry. It is helpful to choose the theme one quarter ahead of time, because you can align things like webinars for which the speakers may be booked months in advance. We then broke up the first quarter into supporting monthly themes—Attrition, Coaching, and Employee Experience. These themes were typically dictated by the speaker for that month’s webinar. This isn’t a requirement for everyone, but as is the case for many B2B companies, webinars were the best-producing campaign at this startup, so we chose to build around them. Our intention was to have two major pieces of content each month—a webinar and a guide. Then, at the end of the quarter, we would combine the three guides into what we called an Ultimate Guide. The idea is that each month we were creating one chapter of the quarterly guide. It is unlikely that the majority of people would download all three guides, so there was still value in combining them and promoting them as a single ultimate guide. The fun doesn’t stop there, because we aligned our blogs to the theme as well. I have already shared how aligning your social media and blogs can get more people to sign up for your webinars and bigger content pieces, but it can also save you a lot of time as well. Just as you are using the monthly guides to create chapters for the quarterly guides, you can use that month’s blogs to create the monthly guide. All you have to do is create an outline and break it up into stand-alone sections. But wait, there’s more! You could easily produce more content without a lot of additional effort. People love stats and stats can make your content much richer. 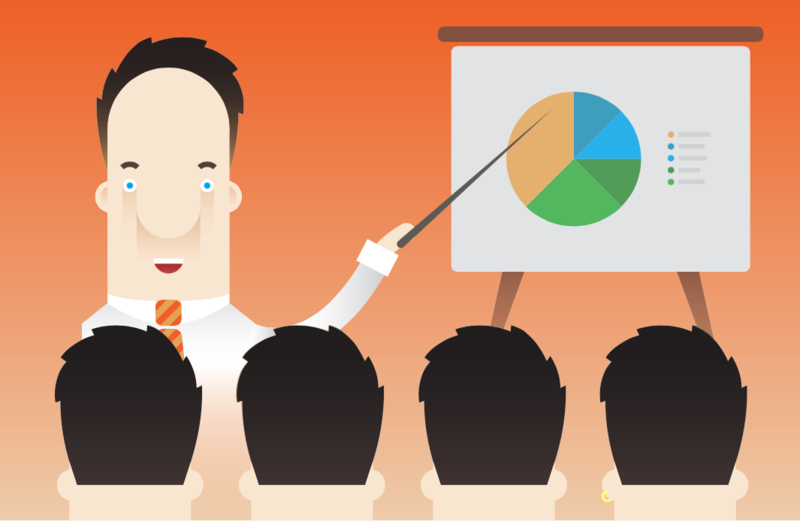 You could find stats for your blogs and guides and then create an accompanying infographic. You could repurpose the material from the guide into a series of videos or interview your webinar speaker on video. There’s no end to the different ways you could repurpose the same material for various content pieces. Another important nuance to the planning is to keep it very lean and agile. This will keep you from becoming paralyzed by over-planning. You should have the next month well planned. Know what webinar, guide, and blogs you are creating. Have a plan for how they will be integrated to promote one another. The month after next, you should have the topic and webinar speaker lined up, but not much more. This will allow you to adjust as needed and keep things as simple as possible. Let’s dig deeper into choosing a theme. A theme could be a specific customer problem, an industry trend, a product feature, or really anything. The main point is that you choose a topic and then coordinate all the content, campaigns, and promotions to align with that topic. The benefit is that all of your messages are in sync and that they lead people interested in the topic to engage with you more deeply and eventually to convert. One option is to choose a product theme. Again, I’m not suggesting that you write product-centric content, but that you can align to a product theme. For example, you may have a big release that quarter that is around a specific feature such as reporting. You could make reporting, business intelligence, or dashboards your theme. Then you could determine the problem scenarios in which your ideal prospects would need the benefits of that feature. To stay with our reporting example, let’s say your ideal prospect is an IT executive who is pulling his hair out because he has to commit to deadlines but doesn’t have adequate visibility into the progress of his projects. The valuable content you could offer can be how to build a structure for accurately communicating the progress of projects. Most reporting tools are only as good as the data being entered into the system, so for a reporting tool to work, the organization would need a process for communicating progress. A tool, of course, makes this easier, but the process still has to be put into place for the tool to work. Instead of writing about the tool, you write about the process. Webinars are often the cornerstone of most B2B marketing plans, and you often have to book your speakers months in advance. I work with a company that chooses an industry trend for its quarterly theme. The staff chooses their themes a quarter in advance and then book their speakers. Once the speakers are booked, the speaker’s topic dictates the monthly theme. Most B2B marketing teams typically have at least a few major content pieces already in the works. These could take the form of a white paper, eBook, or infographic. Like webinars, these major content pieces could be the cornerstone of your monthly or quarterly campaigns. As we discussed earlier, whether you are producing a blog post or writing a white paper, your end goal should be to attract people who are trying to solve a problem that your product addresses. Take the call center software company described earlier in this section. The staff align their themes to their webinars. They have to book their webinar speakers in advance, so they choose their quarterly theme, book the speakers who are available, and then align their content plan to that month’s webinar topic. Recently, they needed a guide/eBook that aligned to a webinar about Workforce Optimization in call centers. It was a requirement that the guide be about Workforce Optimization. Workforce Optimization is a new method call centers are using that optimizes and automates when call center agents are taking calls, receiving training, and doing off-phone work. The method is essentially about using technology to deliver training and off-phone work to agents when call volume is low and then placing the agents back on the phone when call volume is high. You can imagine the cost and revenue benefits of such technology. The company sells a valuable SAAS to call centers that provides these capabilities. The webinar was planned to be technology-focused, but it was being given by an industry analyst from whom people wanted to hear. Our guides, on the other hand, were always very “how-to” oriented and problem-centric. It was a challenge to take such a technical topic that aligned so closely to our product messaging and turn it into a “how-to” guide. We went through the five steps to determine an interesting problem topic. We asked ourselves why someone would want to learn about workforce optimization. 1) First, we reviewed our strategic goal, which was to grow sales-accepted leads 50% this year. have 10% of the converted visitors sign up for a trial. 3) Then, we determined who our target audience was. Our ideal prospect was a VP of Operations of a Fortune 1000 company, with responsibility for call center operations, and who wants to implement workforce optimization. 4) After that, we defined what the benefit of the solution was. First, we explored what this workforce optimization webinar does. It provides guidance on workforce optimization best practices from an industry analyst. We then explored why this would be of value, namely providing executives in charge of workforce optimization projects with the most up-to-date information so that their projects would have the best chance of success. 5) Finally, we defined the problem scenario. Executives needed to implement workforce optimization for the first time and they didn’t necessarily and specifically know what steps needed to be taken. This led us to the theme “How to Build an Executive Roadmap for Workforce Optimization.” The idea was that we would write a guide about the non-technical aspects of implementing workforce optimization. There was a lot of information available about the technology, but there wasn’t much information about the other aspects: people, processes, and change management. Not by accident, the process we described in the guide closely aligned to the process customers used to implement our SAAS solution. We provided readers with value by showing them how to prepare their organization for optimizing the workforce, regardless of the technology a company ended up using. Below the surface, we were also explaining our position on how to best optimize workforces. If a reader became a lead, this early marketing content would align to the later sales messaging. Aligning your marketing themes to your product makes it easier to create a funnel that steps ideal prospects from a problem-centric, top-of-funnel content piece to a sales-accepted lead. It ensures that your messaging is consistent whether a potential prospect is reading a blog post or a sales-accepted lead is viewing a sales presentation. I hope this article has inspired you to start using marketing themes. 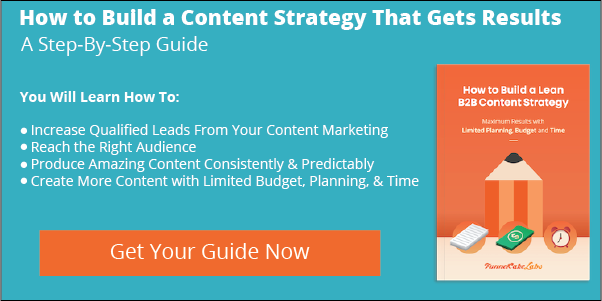 This article has covered one of the eight steps for creating a content marketing strategy to enable you to maximize qualified leads with limited budget, time, and planning. Check out the full guide below to learn about the other steps and start getting the best results from your content marketing.